Thanks to the durability and long life of laminate countertops, Portland Oregon homeowners often end up with old, outdated countertops that still have plenty of life in them but are worn or somewhat lacking in style. Fortunately, Formica laminate countertops are fairly simple to resurface for a quick kitchen update that won’t break the bank. Faux natural stone. Natural stone is all the rage in home décor these days, but not everyone can afford high-end stone countertops. Portland homeowners can achieve the look for a fraction of the price, however, by simply resurfacing their laminate countertops. Portland, Oregon countertops can be revamped to mimic the look of either marble or granite. Faux metal. Laminate countertops can also be resurfaced with a copper or bronze finish to create the appearance of a metal countertop. Faux concrete. Concrete is another popular choice for contemporary kitchen countertops. Portland homeowners can achieve this look by pouring a thin layer of concrete over existing countertops. There are several different methods of resurfacing your Portland laminate countertops, depending on the look you want to achieve. For most techniques, the process begins by thoroughly cleaning and sanding the countertops, then applying a layer of adhesive and covering the old surface with a layer of new material. However, the type of material you use can vary. 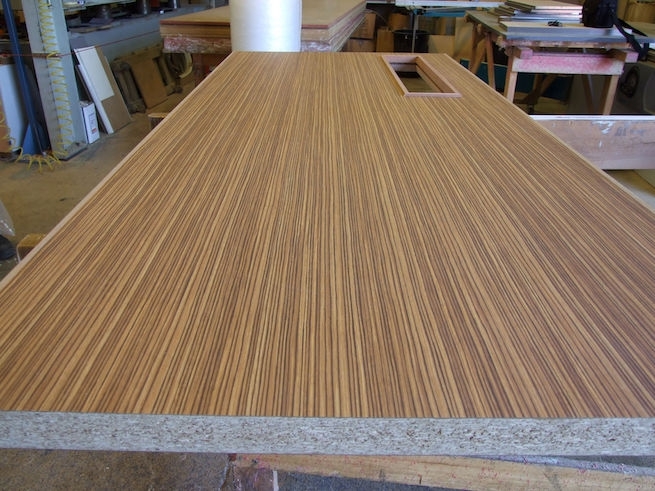 Formica laminate. One of the simplest techniques is to lay a new layer of Formica on top of the existing countertop. Today’s laminate comes in a variety of modern colors and designs and can even provide the illusion of quartz and other high-end materials. Choose a piece of laminate that is slightly larger than the surface you are covering to give you some room for error when positioning the new countertop; you can cut the excess off with a router saw once the adhesive has dried. Decorative chips. To create the appearance of natural stone countertops, Portland residents can sprinkle the surface with decorative vinyl or mineral chips, which are then covered with a protective coat. This technique results in a durable countertop that has the coveted speckled look of granite. Concrete coating. Another way to achieve a customized marble, concrete or stone appearance is to cover your countertops with a thin coating of concrete, which can then be colorized with pigments to create a natural, custom look. Resurfacing is both a simple and affordable way to transform your laminate countertops. Portland, Oregon homeowners can attain a trendy and stylish kitchen for a fraction of the cost of a full-on remodel.